Belgium has seen more than its share of warfare. This small country has the disadvantage of sitting between France and Germany, two historic rivals, and thus the Belgian countryside is filled with battlefields, memorials, and fortresses. In August 1914, Germany invaded France. Although Belgium was neutral, Germany decided to sweep through it in order to attack France from her less protected northern flank. Most of the French army was on its shared border with Germany, and going through Belgium allowed the Germans to almost reach Paris before the French and British could stop them. It was the start of the First World War, the biggest conflict the world had yet seen. 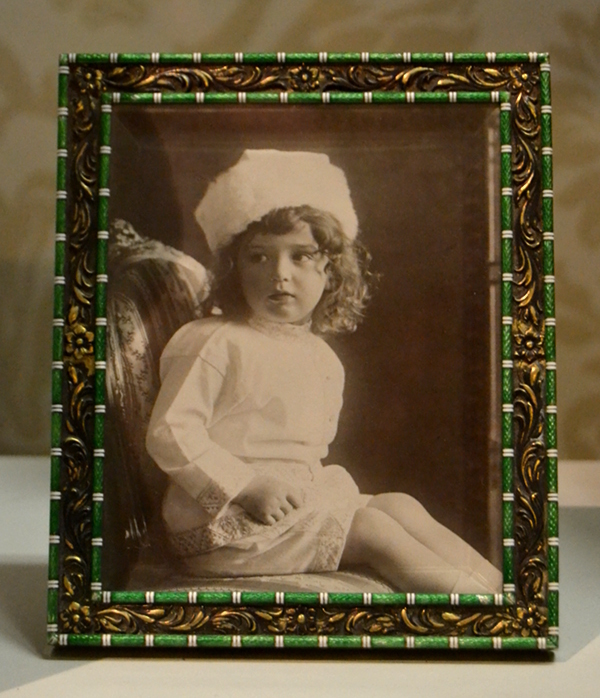 (above) A photo of the Tsarovich Alexei, son of Czar Nicholas II of Russia. Kaiser Wilhelm II of Germany kept this on his desk throughout his life, even when he ordered the invasion of Russia. The royal families of Germany, Russia, the United Kingdom, and Belgium were all related, but that didn’t stop the war. This photo is in the war museum in Belgium. Last month, the extensive Royal Museum of the Armed Forces and Military History in the capital Brussels reopened its newly refurbished World War I wing to commemorate the events of 1914-1918. While Belgium lost 90 percent of its territory in the opening weeks, it never stopped fighting and “Brave Little Belgium” became a rallying cry for the Allied forces. A wealth of displays show life in the trenches and in the occupied towns, and highlight the atrocities the German army committed during the invasion. Memorial at the site of the Christmas Truce football match at Ypres. While the war saw brutal fighting in unimaginable conditions in the trenches, it also saw glimpses of humanity and fellowship. On Christmas 1914, the guns mostly fell silent. Along a stretch of trenches near the Belgian city of Ypres, the Germans started singing carols and poked a Christmas tree above the parapet of their trench. The British soldiers opposite them began singing carols too. After a time, soldiers peeked over the parapets and waved to their supposed enemies. More soldiers came out of cover, and soon the Germans and English were trading presents and even organized a football match on No Man’s Land. The site of this match is now marked by a memorial. Football fans from around the world come to offer footballs in honor of those who started the Christmas Truce. But for the most part, Ypres was a killing ground for four years of brutal warfare. The fields around Ypres are filled with the debris of that titanic battle, and the local farmers speak of an “iron harvest” every time they plough their land. Sometimes this has fatal consequences. On March 19, an old artillery shell or grenade detonated at a building site where workmen were digging. The BBC reports two workers were killed. This happened on the same day I visited, and I was only a few kilometers away at the time. Hearing the news the next day brought the losses of that war much closer to me. The St. Symphorien Military Cemetery. The Belgian countryside has countless graveyards and memorials to the war dead. One of the most moving is the St. Symphorien Military Cemetery on the battlefield of Mons. For most of the war it stood behind German lines and right after the war it was used by the Allies, thus it contains the dead from both sides. I arrived there at dusk, when the sun was setting behind the screen of trees and the entire graveyard had that eerie blue-black hue of the end of day. Tucked away in a wooded corner of a farming district, it was silent except for the occasional birdsong. The gravestones were set out in orderly rows, both German and British side by side. Grave of Private George Lawrence Price, last Commonwealth soldier to die in World War One. Grave of Private George Lawrence Price, last Commonwealth soldier to die in World War I. The grave everyone wants to see is that of George Lawrence Price, a Canadian soldier who was killed on the last day of the war. The warring governments had agreed to an armistice to start at 11 a.m. on November 11, 1918. Just before the final ceasefire, Price and his unit were fighting the Germans for control of a village. At 10:58 a.m., Price was shot and became the last Commonwealth soldier killed in World War I. It seems strange that anyone would fight when they knew that peace was coming that day, but several hundred are known to have died on November 11. In one part of the line there was a terrible artillery bombardment, as if the gun crews wanted to get their last shots off before it was all over. An American soldier, Henry Gunther, died during a charge ordered by his commander literally at the last minute, a pointless waste of the life of a man who, ironically, was of German descent. Gunther charged a German machine gun position and the Germans, who knew peace was just a minute away, waved him off and fired warning shots. When Gunther kept coming, they had no choice but to shoot to kill. He is often called the last casualty of the war. But that’s only the Western narrative. It was a world war, and fighting continued in the Middle East and Africa for some weeks before word could spread to all units that peace had been declared. No one knows who the last casualty of World War I was, but most likely it was an Arab, a Turk, or an African, killed in the war Europe started. It wouldn’t be long before “The War to End All Wars” proved to be only the first of two world wars (... so far). Hitler invaded Belgium in 1940 in a sweeping move to take France. This time it wasn’t just a strategic decision, it was part of Germany’s plan to take conquer all of Europe. Once again the world rallied to fight German expansionism, and once again Belgium became the battleground for greater powers. The fiercest fighting occurred around the town of Bastogne in December 1944. The U.S. Army had liberated the region but the Germans launched a surprise offensive now known as the Battle of the Bulge. A large section of the American army was cut off at Bastogne and had to fight against an army twice its size for a week before it could be saved. The teddy bear who survived a German artillery bombardment. The museum is large and detailed, taking the visitor through military and civilian life during the invasion, occupation, and liberation. One touching display case includes several everyday objects each with their own story. A teddy bear played a small part in the Battle of the Bulge. When the Germans started bombarding Bastogne, a family that was talking to some American soldiers hurried for shelter. Once they were safe in a cellar, the little girl of the family realized she had forgotten her teddy bear. Some brave G.I. rushed back to her house amidst exploding shells and retrieved it. Luckily both the soldier and the bear survived. These are only some of the thousands of stories from the world wars that can be uncovered on a trip to Belgium. Anyone with an interest in history will find this little country a great destination. Not only does it have hundreds of world war sites, it also boasts some 400 castles, several world-class museums, the famous battlefield of Waterloo, and of course good beer. What more does a history buff need? All images copyright Sean McLachlan. This trip was supported by Visit Belgium. All opinions are my own.